We earn your trust from the ground up! Sabine Valley Pipeline, LLC, a subsidiary of Anadarko Petroleum Corporation, has contracted Lonestar Land Services to perform all Right of Way acquisition within the Haynesville Play in East Texas. 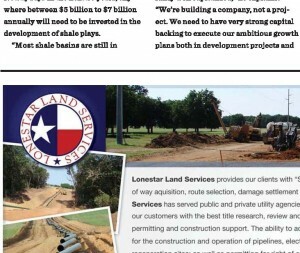 Lonestar Land Services teams up with DCP Midstream in several markets across Texas, Oklahoma and Kansas. Lonestar will provide Right of Way acquisition, permitting and title support for several phases of projects in these market areas. Please see our advertisement in the Energy & Mining magazine along with the article about one of our major clients, Summit Midstream. Click on the image below to view the pdf version. Lonestar Land Services © 2019. All Rights Reserved.